"Everybody experiences far more than he understands. Yet it is experience, rather than understanding, that influences behavior." It would save my writing this if the world had working models of planned eco-communities to experience. Until we do, I will go on struggling to express in words the logic of creating such places, and what I know "nonverbally" to be their true value. Time is running desperately short. Humanity is destroying the Web of Life at an ever increasing rate. At present, six species go extinct each hour worldwide, 144 each day and 52,560 each year. By the year 2,000 most of the world's rainforests will be gone, and with them, 50% of all earth's known life forms. More river, lake, marsh and ocean ecosystems will be dead or dying from pollution, and more vast areas of earth's arable lands will be turning into deserts. Humanity is weakening the biosphere, the web of life, our life support system. The ozone layer may be degrading. If it degrades beyond a certain point we are in danger of destroying all life on earth. The question is, can a strategic plan be implemented to stop this massive extinction of life? For me, the short answer is yes! Such a plan must be based in creating sustainable living environments for humanity worldwide. The longer answer - I have attempted to outline in the following paper. If we work together, we can protect the biosphere the web of life, our life support system and create a joyful and abundant future. A way to accomplish this is to live in planned eco-communities, work in or near home, participate in cyberspace, utilize micro-climate agroforestry and return to the natural calendar of 28 day months and 13 month years known by indigenous peoples as "Turtle Island Time." My formal training is in the field of architecture and planning. My business interest is that of designing and building planned eco-communities, each with their own renewable resource systems. My vision is to implement worldwide a strategic plan for funding restoration of the natural environment by designing and building new planned eco-communities; by transforming existing communities and cities into eco-communities and eco-cities; and by developing micro-climate agroforestry eco-community systems. By implementing these strategies humanity can protect the web of life. (our beautiful biosphere). By living in eco-communities and eco-cities we eliminate harmful pollution. By creating micro-climate agroforestry systems we create sources of renewable wealth and eliminate open field erosion and the need for chemical farming. We also eliminate the need to disturb old growth forests, the homes for so many of earth's life forms. My first experience of planned eco-community building, at the time called "enviromental building," was in 1971 in the Allegheny Mountains near Manns Choice, Pennsylvania. A partner I made a down payment on 450 acres and began a four year process of planning and building the rural community known as Glade Spring. The community was located on a beautiful set of sloping wooded hills with spring fed streams leading through deep woods with high open meadows over-looking 20 mile views of the valley. It was our dream cametrue. We created 25 wooded home sites of 10 to 15 acres, each with views of the valley, sharing 130 acres of community owned property called the parklands or commons. The parklands were composed of the high meadows, a 100 year old farm house, barn and stables with beautiful views in all directions. The parklands also included Lake Francis, ringed by a pathway to the famous "rope swing," a jumping off place! In addition to having great fun creating Glade Spring, designing and building most of the homes and living there for 5 years, we learned the benefits of combining private and common ownership into each deed. While each property owner privately owned 10 to 15 acres, the property owners also owned an "undivided interest" in the 130 acres of parkland or commons. Covenants were recorded in the county court house and require unanimous consent to be modified. The covenants stay with the land giving each land owner personal power to protect the entire 450 acres. The covenants prohibit further subdivision of the land, disallow hunting, motor bikes, and motor boats, etc. Today, Glade Spring is just as beautiful as the day we left, many years ago. The only difference is all the new grandchildren swimming in the lake. As Marshall McLuhan said, "we experienced far more than we understood." I came away from the experience appreciating the comfort of an extended family of neighbors sharing ownership of community property and the unique gifts and personal expressions brought by each community member and by the rural neighbors of the surrounding area who also shared in our community experience. Now, 25 years later, I find myself focused on the same basic interest. Even though the communities are larger and more complex and there are new words to describe them - two points are clear, eco-communities must be enjoyable and profitable for builders and inhabitants, or they will not be built. The good thing is they are! 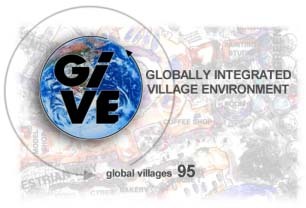 During the Global Village conference, held in June of 1993, a number of papers were delivered discussing walkable eco-cities and the need for eco-community building. The paper I delivered was entitled New Spaces for Living. It addressed the benefits of walkable eco-community living and the economic power of sustainable development. The paper opened by encouraging Austria, and Europe as a whole, to learn from America's mistakes over the past 50 years and work to avoid repeating them, in particular those concerning auto-centered land use. By auto-centered I mean living in communities where you have to use a car for almost everything. Most of America, and most of the world, still assumes this kind of living creates economic advantage. As we learn more, auto-centered living will reveal itself as the massive economic disadvantage that it is. While people existing in auto-centered communities are stuck in traffic and enveloped in pollution, people living in planned eco-communities may have already taken a walk in the clean, quiet morning air, made their first business deal of the day and be on to the next one which can happen while walking in the community plaza or sitting in a fresh air outdoor cafe. In Italy it is said, if you want to meet with an important man go to the piazza. A powerful economic advantages of living and working in planned eco-communities is: The increased opportunity for inhabitants to meet each other and develop mutually beneficial relationships. When people find themselves in pleasant, safe, pedestrian-oriented circumstances it is easier to take part in positive social exchange. In June of 1992, during the Earth Summit for the Environment and the Global Forum held in Rio de Janeiro, Brazil, a heightened example of this took place. Some 40,000 participants came from all over the world to take part in the two week event. The Global Forum, a meeting of non-governmental organizations from all over the world, was held in Balboa Park on Rio's waterfront. The large park held over 20 tents for speakers and performances. Speeches and performances were given each day all day for two weeks! Eight hundred booths for organizations and green-technology displays lined paths connecting the tents. There were also temporary patio cafes set up along the paths, providing participants and visitors places to eat and relax. Over 250,000 people visited the park over the two week period. We felt overwhelmed with the concentration and wealth of human resources who had come together from so many different places. The challenge was, "how to meet them all" and have meaningful exchanges. As time passed, people started saying they were living in "Rio-time", Rio-time was defined as the perfection of the "accidental meetings" with just the people a person wanted to meet. By the end of the third day people were typically dropping their calendars of events and just "going with the flow'' and totally enjoying the surprise of sitting down to lunch and noticing the person they had hoped to see that day, sitting at the next table. The offical U.N. "Earth Summit" on the Environment itself was attended by more heads of state and key government officials than any other single event in the world's history. The "Rio-time" story is told to underscore the notion that in planned eco-communities where interesting people focus on interesting things and choose to meet in friendly pedestrian-oriented circumstance, the possibility for a "Rio time" type of experience of synchronistic networking and meaningful dialogue exists. The main difference might be to name the effect, "Eco-time." A second powerful economic advantage to living and working in eco-communities involves the savings of time. How much time is spent traveling to meetings, traffic jam's, finding parking spaces, auto maintenance, auto accident related law suits, hospital time, rehabilitation time, traffic school, etc.? I estimate that living and working in an eco-community will save a person at least two hours per day of logistical time, time just moving around getting things done. If so, a person could save 14 hours a week or 728 hours a year. Based on a work week of 40 hours this could be the equivalent to 18.2 work weeks or 2.2 months of extra work time of "free" time per year. If the Los Angles metropolitan area has 4 million workers, two hours saved per day would equal a savings of 8 million hours each day, 56 million hours a week, and 2.9 billion hours in one year. At $10 per hour that would equal $80,000 million a day, $560 million per week and $20.9 billion a year. Non working people would also save logistical time which would be added to the time mentioned above. What each person will do with their new found economic advantages is unclear but some will make important contacts and have more time to spend on new projects that can lead to making additional positive contributions, and more money! The increasing jobs base and increasing revenues from new projects can combine with efficient eco-community living and the economic strategy of minimizing imports, to result in accelerated accumulation of individual and community wealth and equity. Unlike existing communities which operate on a debt based system, eco-communities will operate on an ever increasing equity base with an expanding economic advantage. Working in or near Home - A personal choice shared by many. For me, living in eco-communities includes: walking to work from my breakfast room across a garden to my office; being near my kitchen during my work day; having fresh organic food to eat, clean water to drink and fresh air to breath; having office doors that open to a beautiful and quiet view of the natural environment or community park; having my community and home equipped with state of the art telephone and video cable service connections to cyberspace (the Internet and the World Wide Web) and having the appropriate computer and telecommunication access hardware and software. Other economic advantages include: living within a short walk of organic food stores and farmers markets; stores selling basic home and office supplies; copy and mail services; ethnic restaurants and a great bookstore cafe! If I'm married, my wife's office can be just across the garden. If we have kids, their school, piano teacher and friends are all within walking, biking or trolley ride distance on safe, pleasant, pedestrian-oriented streets, and like living in Glade Spring, we will be able to enjoy the experience of our extended neighborly family. For others who choose to work away from home, creating economic advantage may mean walking across a beautiful park to work, riding a bike or taking the trolley. If one's work is in another community, going to work could mean taking a quiet, fast-moving electric rail transit, system. Also this will create a wider range of movement for older people who can no longer drive, and for the handicapped and children who are unable to drive. When an automobile is needed for trips away from the community, all one will have to do is call up the community rental service and select from a wide range of vehicles, the one that best fits the need, and it will be clean and serviced every time it is used. Other benefits to eco-community living include access to a wider range of options in housing. Single parents who need day care can have it close at hand in safe, pleasant surroundings where parents and kids can get to know each other. Because of design efficiencies and the reduced sizes of clustered eco-communities, I estimate they will cost 30% less to build than existing urban sprawl communities. They will also cost 90% less to operate and be free of harmful pollution. The following facts support these predictions: Currently, about 40% of the cost of building urban sprawl development is transportation related. In contrast eco-community transportation infrastructure costs are estimated to be 10% of the total community infrastructure budget. If so, this represents a 30% savings by itself alone compared to current urban sprawl infrastructure cost. Other cost reduction savings of up to 70% to 90% are based on the vastly smaller clustered community footprint. They involve: grading, storm drainage, water supply and waste water piping systems; natural gas piping; and electrical and telephone video cable line installation. Other savings involve the types of structures and green-technologies unique to clustering. I define community operating cost as being composed of both public and private cost. City budgets pay only a small part of the ongoing cost of operating urban sprawl communities. The 1992-93 operating budget for the city of Los Angeles was just under 4 billion dollars. This might seem like a high number until you look closer at what it actually cost to operate the city. A study in 1992 by Runzhecimer International, a management consulting firm, shows that in Los Angeles area the average private car currently costs $7,529 each year to own and operate. With 8 million total cars in the metropolitan area, that puts a "partial cost" of private transportation, in the LA area at over $56 billion each year! That's right, $56 billion each year down the drain. When annual cost of heating and cooling urban sprawl development are included each year, the true cost of operating the LA area are over $100 billion each year, $100 billion just to "turn the key on" and keep it moving. Eco-community yearly operational costs for transportation systems, including the acquisition and operations cost of auto rental fleets, will be no more than 10% of current urban sprawl transportation figures, based on a reduction in auto usage of over 90%. Reductions in water will also be over 90%, based on less landscaping within the community and reuse of water in agricultural areas. Reductions in heating and cooling cost will also be over 90% based on improved insulation and green-technology delivery systems. Worldwide, countries, cities, smaller communities, groups and individuals are scrambling for their chance and their place to participate in local and global life. Whatever provides economic advantage in the age of global access will be quickly utilized. While it is true that American communication systems and other types of American infrastructure are more advanced than most, in comparison to what is possible they lag far behind. As presented above, what is possible is the building of ecologically sustainable communities which are profitable and through the increasing community capital, support the building of other such eco-communities and as a group fund the restoration of the natural environment. In his recent book Being Digital, Nicholas Negroponte, Director of the MIT Media Lab, tells the children's conundrum; "working for a penny a day for a month, doubling your salary each day." "If you started this wonderful pay scheme on New Years Day, you would be earning more than $10 million per day on the last day of January. This is the part most people remember. What we do not realize is that, using the same scheme, we would earn only about $1.3 million a day if January were three days shorter (i.e., February). Put another way, your cumulative income for that whole month of February would be roughly $2.6 million, instead of the $21 million you earned in total during January. When an effect is exponential, those last three days mean a lot!" Negroponte says "We are approaching those last three days in the spread of computing and digital telecommunications" (digital - the movement of bits of patterned light). I include this conundrum used by Negroponte to underscore how startlingly fast, now, I feel planned eco-communities will emerge worldwide, and how the gap in the quality of life will widen between those living in such eco-communities and those who do not. This will put great pressure on existing communities to improve their infrastructure to accommodate the eco-community lifestyle. As this paper is written, to my knowledge, their are no complete planned eco-communities existing. Even as the first ones are being built few will take much notice, but "the day after they open, they will be the only game in town." At lighting speed other such communities will emerge worldwide because people who live and work in them will have such a powerful economic advantage and an improved quality of life. For those countries, cities, smaller communities, groups and individuals who feel confident in their current ways of life, I suggest they notice what is happening to those who have decided to fully embrace and maximize their opportunity in the emerging age of access. The pattern to date favors those who maximize the opportunity of access and it reveals a widening gap in the quality of life almost to the extent of creating two realities. And this is only the beginning. Living in one of the first eco-communities or local cluster of eco-communities will be in many ways like living on a university campus or local series of campuses. Similarly on a global level eco-communities may be seen as a planetary network of living universities. Individuals who live within and near these learning centers will experience markedly higher qualities of life. Residents will be able to travel freely between them in real time and through cyberspace in virtual time. Advancements in computers and their connection through global telecommunication systems are an essential component in creating the network of universities for a sustainable future. Unlike times past the difference in the quality of life will not show up by country or region. In the early stages of eco-community living the difference will show up much more locally, where a single planned eco-community or small group of such communities are built. The citizens of these first planned eco-communities will live abundant, interesting and varied lives. Also, because of the increased opportunities for business offered by eco-community living and because of their efficient infrastructure operating systems, large amounts of capital will be accumulated or released for other use. This capital can be used to fund the start up of new planned eco-communities and to protect, preserve and restore the natural environment worldwide. On Earth Day 1991, Ian McHarg, author of "Design with Nature," said, "The fine art of the 21st Century will be that of restoration of the natural environment. We need, not only a better view of man and nature, but a working method by which the least of us can ensure that the product of his works is not more despoliation." Taking apart what has already been built is much harder than starting anew. In a way, this gives Austria, and Europe as a whole, an economic advantage over the US. The urban sprawl automobile-centered pattern in Europe, while building momentum, has not yet taken over. If within Europe, deliberate eco-design strategies are set into motion now, it will cost far less to make the jump to sustainable living than in the US where sprawl infrastructure must first be taken apart. It is clear that Austria and Europe are committed to preserving their historic cities, and protecting their villages and countryside. At the same time, they are under great pressure to expand their economies and their housing and services. This growth pressure can be put to advantage and utilized to go straight to eco-city retrofitting and new eco-community building. By making this decision Austria and all of Europe can avoid the US auto-centered urban sprawl growth ring model of city expansion. They can protect city and village identity and preserve their countrysides by creating new satellite suburban and rural eco-communities. These new satellite eco-communities will pay for the acquisition and permanent protection of large areas of farmland and open space areas. They will also pay for rail system connections. If Austria were to build some of the first eco-communities, it would set the pace throughout Europe and create models Eastern Europe could follow. Establish a set of ecological planning principles for sustainable living for Ventura County. Involve community leaders from each area of the county to refine the principles. Involve citizens-at-large in the process through similar meetings in their local areas. Establish a comprehensive picture of natural and man made county-wide conditions. Create a concept plan for each area of the county with citizens from that area. Present plans and ideas in the above phases for approval to government officials. Involve citizens in seeing new policy and plans realized and refined on an ongoing basis. The ecological planning principles steer us away from sprawl, toward, clustering, a change of direction that supports preservation and restoration of the natural environment. They also support rail transit and mixed-use, pedestrian-oriented eco-communitie. The five examples of planned eco-community projects that follow demonstrate both urban renewal and new community concepts. The first two demonstrate retrofit strategies for existing cities and communities. The last three show design strategies for new suburban and rural eco-communities, which by themselves protect, preserve, and restore large areas of open space. The Anaheim Mall Project is a proposed Urban Village on 72 acres located in Anaheim, California. By Urban Village, we mean a place where inhabitants can live within walking distance of work, schools, shopping, services, entertainment, recreation and cultural facilities, while having easy access to mass transit for travel to other areas and communities. At present the site is occupied by an old shopping mall with a high vacancy rate. The proposal is to take down the mall and build, in its place, a 16-acre central park surrounded by three and four story buildings for the above uses. A specific example of the economic savings coming from the Urban Village is the cost of the parking structures. Currently, according to code, the City of Anaheim would require 11,000 parking spaces to serve the Urban Village project. Because of the mixed-use aspects of the project and the rail transit orientation, we propose the parking be cut in half, saving some 5,500 spaces. If parking structure spaces cost $10,000 per space, 5,500 spaces will save $55 million. Instead of building concrete parking structures - a part of the permanent problem - a better investment is to contribute that money toward building rail transit - a part of the permanent solution. Due to the mixed-use aspects of the project, faster absorption of various uses will allow the project to be finished sooner. On a much smaller scale, another example of urban renewal clustering involves the renovationof an inner city neighborhood block. The first drawing shows the block in its present condition, and the second shows it transformed into a mixed-use, pedestrian-oriented neighborhood center. As you will note, in addition to extensive renovation of existing buildings, there is one new apartment building proposed for the block. Not only does this new building provide much-needed affordable housing, but it also provides the additional capital (from increased higher density land value) required to improve the land forming the community's central park, shown on the second drawing. The objective is to bring the property owners within the block together, creating a common goal. In other words, through cooperation and a pooling of resources of both land and capital, all of the property owners benefit economically, environmentally and socially. A suburban eco-community proposal involves a site located in Northern California, in Marinm county just north of San Francisco between the 101 freeway and San Pablo Bay. The bayside land is just north of the city of San Rafael and involves a marsh, an existing dairy farm and a private school. There is also an unused rail line running through the property that connects to the San Rafael Ferry to San Francisco. The proposed community is sited on 139 acres, 8% of the total 1,700 acre site. The following financial analysis shows how much money is generated for the acquisition of open space, mass transit, site improvements and open space restoration programs. This partial savings is derived from less grading, road construction and fewer storm drainage systems, utility lines and final landscaping to be installed. By utilizing true-cost pricing to evaluate a course of action, we take an important step toward long-term economic viability and sustainability withou compromising the quality of life. In true-cost pricing, short term and long economic gains are based first in ensuring the health of natural systems and environments. Once we use this approach everything will change for the better. The following list of community enhancements, valued at $30 million, is an example of what can be gained from the true cost savings of eco-community building. When these community enhancements are complete, it is expected that community property values will increase. This shows once again the value of eco-community building.